Industry associations recognize the importance of helping their members to become more sustainable, to address emerging sustainability risks and opportunities that will affect their sector’s viability. This Industry Association Sustainability Benchmark and Checklist is a tool to aid in that process. The Industry Association Sustainability Benchmark and Checklist is a sustainable industry benchmarking tool to help industry associations assess the comprehensiveness and coverage of their member sustainability programs. 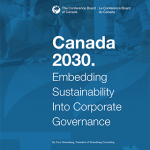 The Industry Association Sustainability Benchmark and Checklist is based on 2007 research into the roles Canadian industry and trade associations are playing to help their industry become sustainable conducted by Coro in collaboration with Five Winds International for Natural Resources Canada. 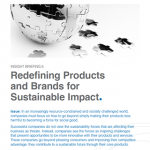 It was updated in 2017 based on new best practices and Coro’s experience helping industry associations improve the sustainability performance of their members and sectors. The tool includes 38 practices for benchmarking purposes. Use the Industry Association Sustainability Benchmark and Checklist to identify strengths and gaps in your industry association program, in order to identify opportunities to further progress your sector on the sustainability journey.